Another contestant likes the idea better than "American Idol"
NEW YORK (CNN) -- Flip through YouTube for five minutes and beyond the bad "Star Wars" parodies and nose-picking tutorials, you'll notice there are a lot of people out there who can sing. Really sing. 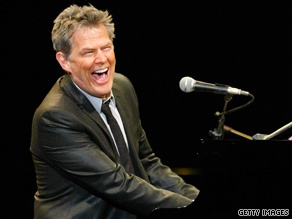 David Foster is involved with a talent contest in which winners get to perform with him on tour. "There's so much talent," says long-time record producer David Foster. "Everywhere you go, there's talent that have no clue how to be heard." But give 16-year-old Mia Boostrom props for having the right idea. She recently set up a camera in her Dighton, Massachusetts, bedroom, propped her guitar on her thigh, hit the record button then sang a breathy rendition of the Maroon 5 song, "Secret." Then she got a call: Would she perform with the 15-time Grammy winner on his October 25 tour stop in Boston, Massachusetts? The man credited for nurturing such talents as Celine Dion, Josh Groban and Michael Buble? Even Foster jokes about his eminence. "It's good to be around me," he says. "I think. Is that wrong to say that?" Boostrom is one of 20 finalists chosen by Foster to join his "David Foster & Friends" tour that kicks off Wednesday in Chicago, Illinois. At each of the 10 stops, two finalists will perform on stage with Foster, one of whom will be chosen to compete in a final showdown at the tour's last stop in Vancouver, Canada, on November 8. The finalists will share the stage with a star-filled cast of musicians Foster is taking on tour with him. The group includes former Chicago frontman Peter Cetera; Earth, Wind and Fire's Philip Bailey; "American Idol" graduates Ruben Studdard and Michael Johns; and Charice, the 17-year-old Filipino newcomer with vocal pipes that some have said rival Whitney Houston's and Celine Dion's. The tour is a spin-off from the PBS special "Hit Man: David Foster & Friends," in which Foster used the piano to accompany artists such as Andrea Bocelli, Groban and Buble in a showcase of songs he'd written or produced in his 35-year career. Foster says to expect special guests in each city, such as Richard Marx in Chicago, and Paul Anka and Neil Sedaka in New York. The contest aspect will give audiences a chance to watch Foster groom fresh talent, a process normally confined to sterile recording studios. For 27-year-old Rosalee Sher, a back-up singer from Las Vegas, Nevada, who's been picked to compete at Foster's San Jose, California, gig, this contest is far more appealing than "American Idol." "I've always been a bit wary of 'American Idol,' " she says. "I think it's the whole television aspect. I may even be a little intimidated by Simon Cowell." "Not so much," she laughs. "I'm just really excited to perform with him." But it won't just be the contestants who'll get a chance to prove their worth on Foster's tour. If you're in the audience, don't be surprised to get a shot at showing Foster what you've got. He says he plans to go into the crowd, mic in hand, inviting people to sing. As Foster was quoted on "American Idol" last season, "In life, the microphone passes your lips but once ... you had better be ready to sing."